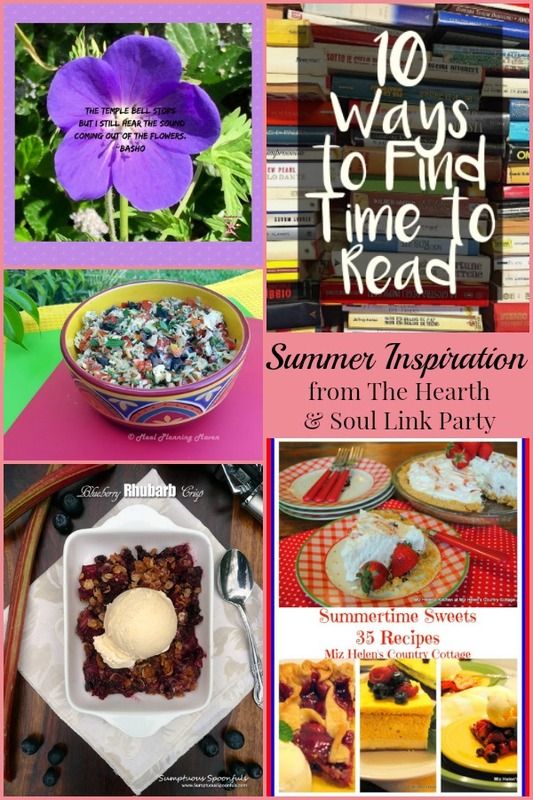 It’s all about fresh starts and summer inspiration this week at The Hearth and Soul Link Party! Welcome to the party! I’m excited to share our new logo with you. What do you think? 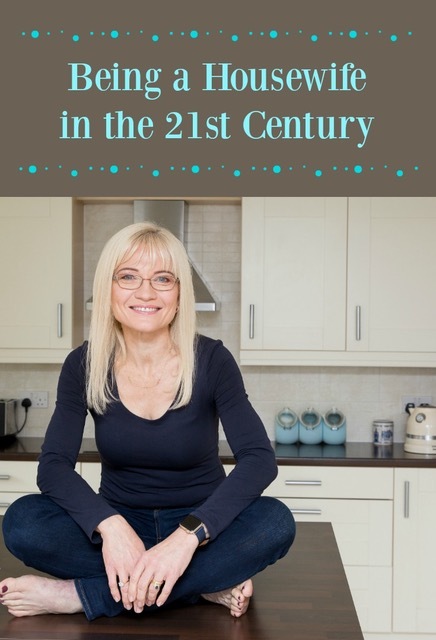 I love this wonderful fresh start for The Hearth and Soul Link Party – and that’s not all! There are lots of new things I’ll be rolling out over the next few weeks, including a Facebook community where we can all share and discuss all the things that feed our souls. Thank you all so much for your warm response to our new look. It was another banner week at Hearth and Soul last week, with even more posts shared. Please do invite your blogger friends to join our community – It’s wonderful to see the party growing! Last week I shared a healthy and delicious muffin recipe that makes a great breakfast or snack. 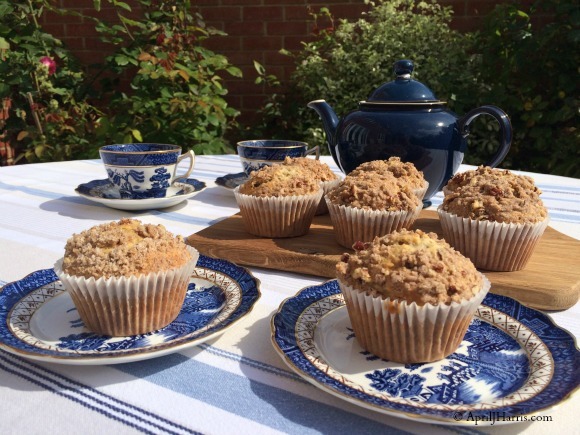 My Banana Streusel Muffins with Flaxseed are full of goodness plus they have a crunchy, cinnamon spiked streusel topping you will love. Thanks for hosting! A nice ice tee and plate of Just Divine Chicken Salad sounds good for summer! Thank you so much for visiting and sharing, Linda. Hope your week is wonderful too! This week I share my last post. A salty yogourth sponge cake. April, your banana muffins look scrummy! And do tell me about the teapot in the muffin photo. Thank you for hosting. I’m going to check out the beet soup first. I’ve never made a beet soup. Thanks so much for the awesome feature for my Summertime Sweets Recipe Collection, what a lovely surprise. Your muffins are just delightful and I have a surprise for you and your muffins. Hope you have a great week and thanks so much for the party! It’s a pleasure, Miz Helen! I look forward to the surprise 🙂 Hope your week is wonderful too! Hi April. thank you very much for hosting. I hope you have a great week. It is finally warm here so I am gladly busy outside. I hope your week is wonderful too, Leanna! Thanks for the great party. Have a fabulous week. My pleasure, Carol. Wishing you a lovely week too! It’s a pleasure, Marilyn. I really am having a lovely time away 🙂 Have a great week! Wow! Thank you for highlighting my Beauty of Basho Haiku post =) Truly, thank you for all your kindnesses, April =) P.s. Tweeting and Pinning your fantabulous treats. It is my very great pleasure, Kim. I loved your post! Thank you so much for all your support and sharing. I really do appreciate it! Wishing you a lovely week. Ooh, that is chilly! Hope the inspiration helps you to dream of warmer days to come, Michele 🙂 Have a lovely week! Thanks, April! Have a wonderful week. Hope your week is wonderful too, Leigh! April, I just adore the new look of the Hearth and Soul Hop…so bright and summery! Thanks ever so much for featuring my Cherry Tomato ‘n Artichoke Tapenade which fits perfectly with your summer theme! This week, I shared my Herb-Crusted Salmon Salad which we enjoy regularly this time of the year when temperatures start rising. Have a wonderful week my friend and as always, I so appreciate all of your kind and generous support. Thank you so much, Linda! I’m so glad you like it 🙂 Thank you so much for all your wonderful support as well! Thanks for hosting the fun party April! Enjoy the weekend. Thank you for visiting, Julie.Hope you have a lovely weekend too! April, your sweet husband chose well – I love that teapot (and all things Blue Willow). My link today shows my Blue Danube cup and saucer.